Jeff Dickie has it summed up well. Delta’s culture will never change while Grady Cameron can play at being a big-shot, buoyed up by his obscene salary and supervised by the likes of Graham Crombie, Richard Thomson and Dave Cull. Talk about the wolves running the chookhouse – you couldn’t make it up. Grady Cameron now on $570,000 and 88 pax on over $100,000! 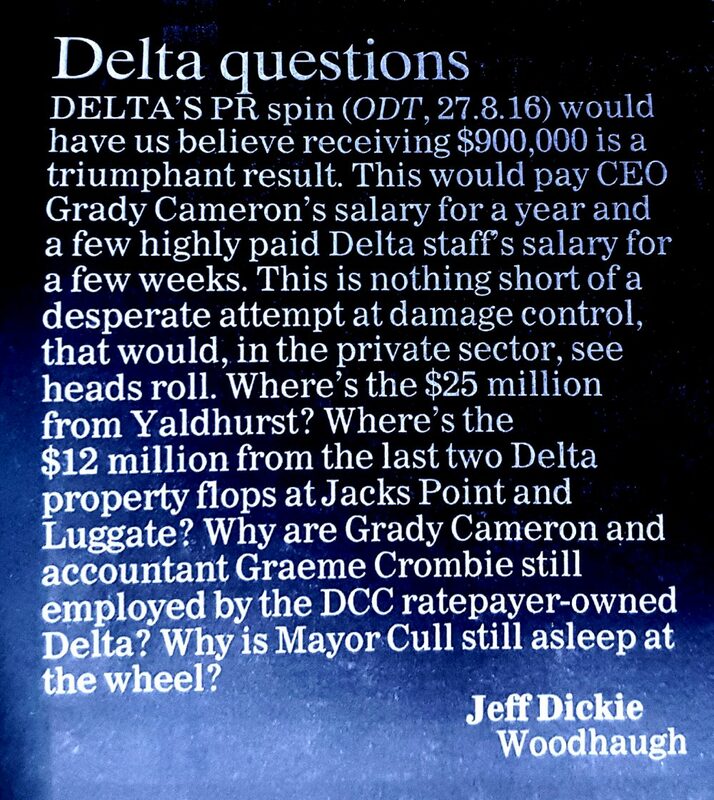 Delta making no contribution to DCC finances and facing another $25 million loss on Yaldhurst. When are we going to get some salary sanity from the DCC and its companies? Next trick will be to sell them at an obvious discount to their mates, just like they did with Mahinerangi. “In order to solve the problem of DCC debt caused by salaries being too high” An obvious self fulfilling prophecy! After the sale of Delta, the new chairman “Mr Michael Favour and his partner Mr David Veryrich noted, our first move will be to say thank you to the previous CEO who has taken voluntary redundancy along with 88 senior managers who have been replaced by 25 smart young buggers who are working for work experience. One year later 1 June 2019, the new chairman Mr David Veryrich stated that the company Favour-Veryrich were very pleased about the contribution of Delta (2017) Ltd which had produced a $500 million profit for the consortium.